This week the Arkansas Lottery announced it is rolling out a new instant lottery game: The Big Money Multiplier. To put it simply, this is an oversize scratch-off ticket that sells for $10 instead of the typical $1 or $2. The odds of winning a prize — such as a $10 break-even prize — are roughly 1 in 3. The odds of winning the $250,000 jackpot are 1 in 440,000. This is the same gimmick the Lottery has used since Day One: Roll out as much gambling as possible as quickly as possible in order to bolster ticket sales. In this case, the Lottery is selling scratch-off tickets that are more expensive than most and offer larger prizes, but the odds are long, and in the end the results will be the same: Arkansans will spend — and lose — millions of dollars buying lottery tickets. As we have written before, many people gamble out of desperation, and the Arkansas Lottery preys on those people with tickets like this one. 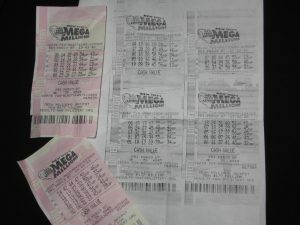 The Lottery’s director says he hopes this new ticket will help pay for college scholarships. The truth is the Arkansas Lottery allocates 18% – 19% of its revenue for scholarship funding. For perspective, the average state lottery allocates 30%. The Arkansas Lottery doesn’t need a new scratch-off ticket to help send students to college. It simply needs to rework its budget. Photo Credit: Mega Millions lottery tickets, by msspider66.